What is the difference between standardised and normal abundance expression profiles? This is a direct plot of the compound abundance after normalisation. This again uses the normalised compound abundance, calculated as for the previous option. However, the y-axis is then transformed - to show standard deviations from the mean. That is, for any given run, the point plotted will show how far the normalised compound abundance in that run is above or below the mean normalised compound abundance over all runs, after being divided by the standard deviation of those data. Hence, a value of 0 would indicate that that run has exactly the mean value for that compound, and a value of +1 on the axis would represent a data point with a normalised abundance that is exactly one standard deviation above the mean of all runs for that compound. The drop-down above the plot allows you to switch between the two options. 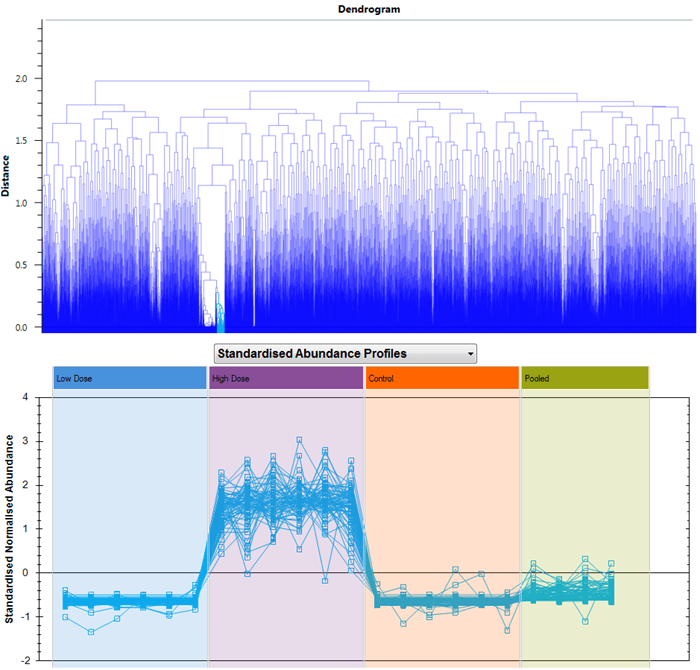 Selecting compounds to show, in this case having clicked on one branch of the dendrogram at Compound Statistics. Normal Abundance Profiles plot of twenty selected compounds among those significantly different by ANOVA for example data. 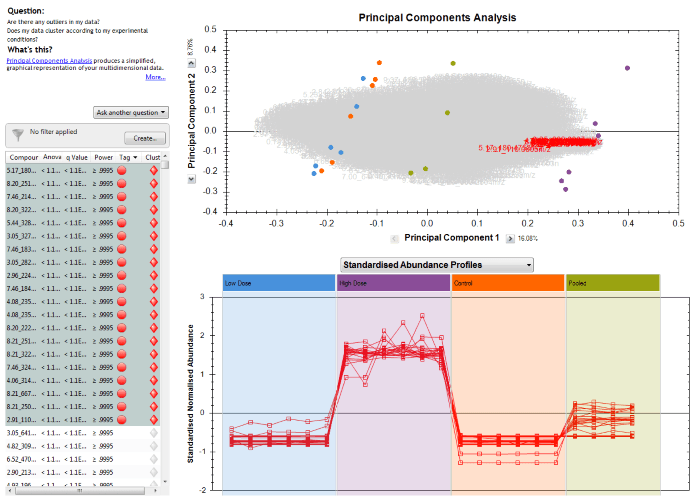 Standardised Abundance Profiles plot of the same twenty compounds. 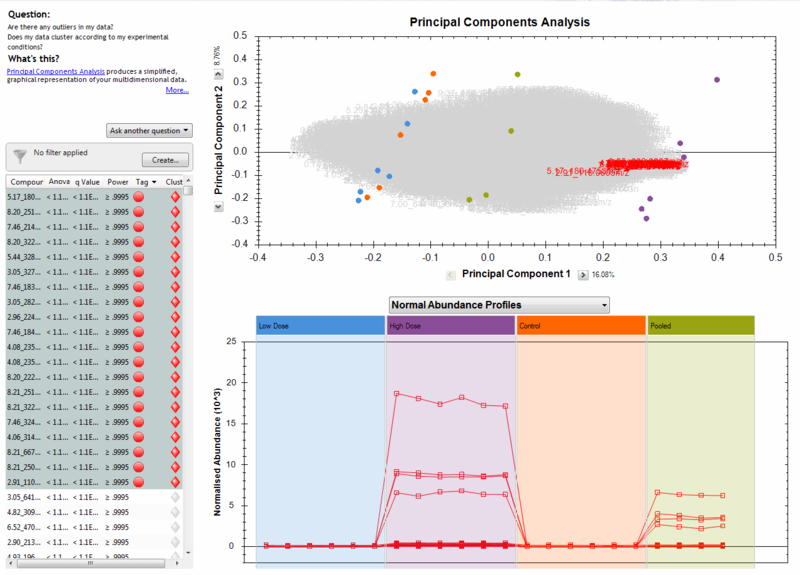 In this way, you can select whether you wish to look at the trends across absolute scale or with compounds all scaled to fit well on the same plot, as is most appropriate for you. Hovering over a data point will tell you which run and compound it was generated from.